The Title Banner is at the top of every page within eMelbourne. About provides information about the eMelbourne project. 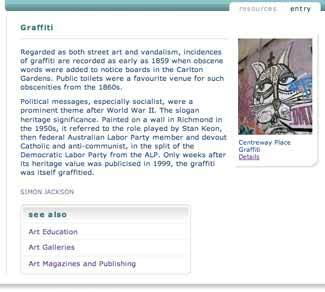 Quick Search allows you to quickly find a word contained within eMelbourne. Three tabs situated at the left of each screen allow the eMelbourne content to be navigated in three ways: by theme (themes), alphabetically (a to z) or by searching (search). Themes: Every entry within eMelbourne has been grouped into one of 21 key themes such as Education, Sport & Recreation and Transport. A to Z: Browse alphabetical lists of the Entries, Resources, Bibliography and Archives. Search: Use single words, phrases and advanced options to search within Entries, Resources and the Bibliography. The list of Entries grouped within the "a to z" mode can be navigated by clicking the letters. Each Entry can consist of text, images and multimedia items. Clicking a thumbnail image will open a larger version in a separate window. Following the body text of an Entry is a list of related entries in the See Also box. At the top right of each Entry is a Resources tab that allows you to toggle between the Entry itself and the related Resources, such as digital resources, archival citations and bibliographical references. Resources are an important part of the eMelbourne site, and we encourage you to explore them. 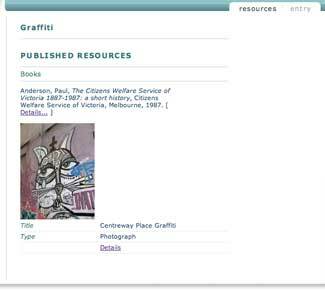 The types of digitised resources you'll find in this area include: artworks, photographs, material culture objects, archival records and transcripts from primary sources.